„Das Event war ein großer Erfolg!“ [„The event was a big success!“] This was just one of the many congratulatory remarks, responses and reactions Sentro received from the audience. About 65 Austrians, Filipinos and mostly students attended the event. 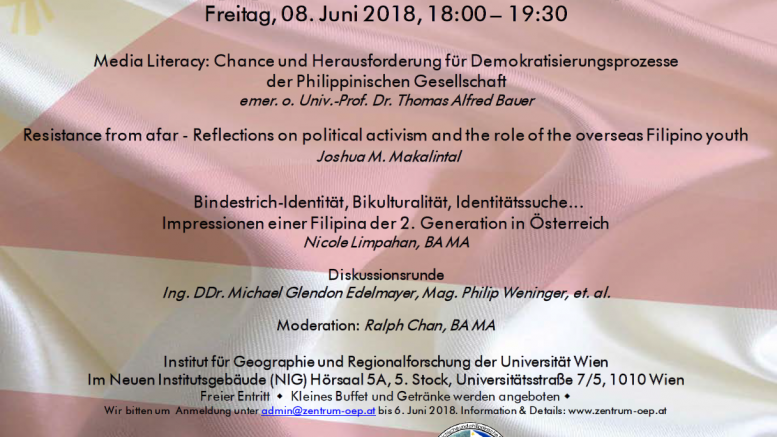 On Friday, June 8th in the afternoon, „Philippinen – Vorträge“, the series of lectures/talks and presentation about the Philippines, Filipinos and Filipinas in Vienna and Austria – was held again. Thankfully, in cooperation with the Department of Geography and Regional Research at the University of Vienna we got a wonderful venue to use. At the „Philippinen – Vorträge“ different topics, themes were presented and discussed during the event. Due to the hot weather on that day, not just the audience but also the presenters (but because of nervousness) had to sweat a lot too. We started the evening with some greetings from the official representative of the Department of Geography and Regional Research ao. Univ.-Prof. Dr. Heinz Nissel, a Geography Professor who works on political geography, urban research with a regional research interest on India. He also did a lot of research stay in different countries and was for example a visiting scholar at the University of Bombay. After the warm welcome our first keynote speaker was presented emer. o. Univ.-Prof. Dr. Thomas Alfred Bauer, who talked about media literacy as a tool for the democratic process. The title of his presentation was „Media Literacy: Chance und Herausforderung für Demokratisierungsprozesse der Philippinischen Gesellschaft“ [„Media Literacy: Opportunity and Challenge for the democracy process of the Filipino society“] We contacted Professor Bauer because he has tight connections and a relationship to the Philippines. He was a visiting scholar and Professor at several universities (UP, UST, Cagayan de Oro) at the Philippines. Professor Bauer works at the Department of Communication and has different foci of work like media education and communication culture; the reciprocity of communication, personality and society; audiovisual media and the cultural development; the cooperation in education and research between science and practice of media communication and furthermore, the communication culture as an instrument. He is part of several scientific organizations and published in different scientific journals. The second talk was a personal reflection on political activism by the Filipino youth in the Philippines, in Austria and overseas. The title of his presentation was „Resistance from afar – Reflection on political activism and the role of overseas Filipino youth“ [„Widerstand aus der Ferne – Reflexion über politischen Aktivismus und die Rolle der philippinischen Jugend im Ausland“] and held by Joshua Makalintal, a political science and law undergraduate student from the University of Innsbruck. After the first two presentations the audience had the chance to ask questions. Some interesting thoughts were raised like: the relationship between society-literacy-media-activism; social media as an information source and tool for activism and media, especially social media as a substitute for relationships and family. Unfortunately, we hadn’t had enough time for lengthy discussions because one more presentation and a discussion were in line. The third presentation was held by Nicole Limpahan, a PhD student for Roman studies at the University of Vienna. She talked about her identity and the challenge of interculturality, identity searching, self-awareness, cultural and linguistic differences, the definition of home and the fear of exclusion. The talk „Bindestrich-Identität, Bikulturalität, Identitätssuche… – Impressionen einer Filipina der 2. Generation in Österreich“ [Dash/hyphen-identity, Biculturality, Identity search… – Impression of a Filipina of the 2nd generation in Austria“] was a reflection of her own experiences. The last part of the event was a panel discussion about the topic of the last presentation. Therefore, beside the presenter there were also Philip Weninger and Michael Glendon Edelmayer invited to answer some questions. Philip Weninger is a graduated Geographer, who did during his master thesis a field work in the Philippines and worked on topics about the Filipino labor migration and diaspora as well as the effects of remittances in the Philippines. He is a member of Sentro. Michael Glendon Edelmayer is a son of a Filipina and an Austrian. Michael is an oral surgeon at the Medical University of Vienna and is the head of a special outpatient department. The discussants – since they are all half Filipinos or Filipinas – were asked about the differences they perceived between the Filipino and Austrian culture; whether it is a challenge or an enrichment for themselves. Also, they were asked about different influences and how they consider having a migration background in today’s society. Further, the audience asked the difference between the values they learned in a Filipino and in an Austrian household or upbringing; the religious practice yesterday and today; if they had or have an identity crisis. An interesting question was: which was more important: to pursue college/university education or gain employment and earn a living for themselves and their parents. After a long evening and before everyone got a well-deserved Filipino dinner with chicken wings, Lumpia and Pancit Sotanghon – the founder and head of Sentro Arlene D. Castañeda thanked everyone for their time, participation and interest. My point of view, all in all, it was a wonderful and enjoyable evening although it was hot in the room and it was not so easy to organize, to manage and to lead the evening as a host due to time restriction (so be aware presenters next time :)). Due to a enormous interest from the audience, Sentro is planning a follow-up event in the same constellation and/or with a different thematic priority. We are already in talks with the current and new cooperation partners! Hope to see you all again. Everyone is welcome to join, to help or just to keep in touch.